The Crawford Family: Dream Fulfilled! 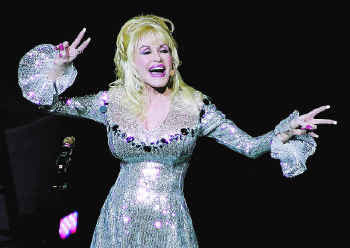 So, this Mother's Day, my husband fulfilled a dream of mine, and that is to see Dolly Parton! I know, you are probably laughing, but since I was a child, I have LOVED her! I grew up on her music and adore her! So, when she was on American Idol recently, I was thrilled! Adam and I went through some hard stuff recently, and in the midst of it all, Adam wanted to do something to cheer me up. So, he surprised me with these tickets! We went and ate sushi beforehand (only the cooked stuff for me, raw stuff makes me nervous!) that was SO delicious! And, then we headed to the Nokia theater to see good ole Dolly! She is AMAZING!!! So funny and so talented! She played 11 different instruments through the course of the show! And, she played every song that I could have wanted her to sing! And, on top of that, I just love being with my husband, he is my best friend! I think that he enjoyed it, if he didn't, he sure did an excellent job of faking it for me! Along with the roses he brought me earlier in the day, he went out of his way to make me feel so special this Mother's Day! I love you Adam, and I am so blessed to get to spend my life with you! Thank you for a special and memorable Mother's Day! When you told me that Dolly was your favorite, I admit I was a little surprised. But I am watching Steel Magnolias right now, and I can totally see the appeal! She's precious and so funny, I'm sure she was a blast to watch live! That was sweet of Adam to treat you. We love you guys!